Clergy Confidential: "Our light will outlast their flag"
"Our light will outlast their flag"
the street from a building displaying the Nazi flag. It was taken in Kiel, Germany in 1932, and while it is a famous picture, I had never seen it before. I remain mesmerized. 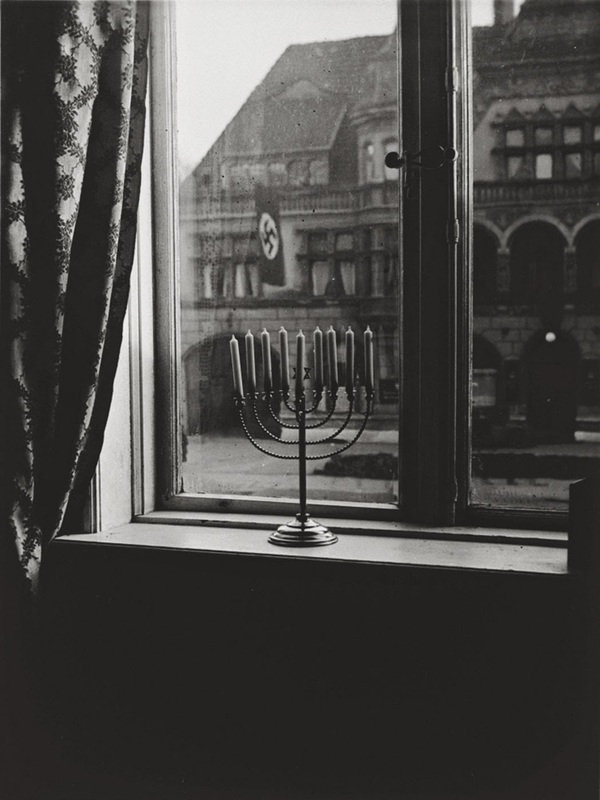 A blazing menorah lit in open defiance of the Nazi regime is a powerful image, one that speaks to history as well as our modern day. What's painful, is pondering the millions of innocent Jews who would be slaughtered in concentration camps between the time the photograph was taken and the end of World War II. This, and the festering of hate in our own day. What struck me most, beyond the visual, were the words hand-written on the back of the photograph: "Our light will outlast their flag." I wanted to know more about the photograph and the person who wrote these words so I did some research. The menorah belonged to Rabbi Akiva Boruch Posner, the spiritual leader of the small Jewish community in the German town of Kiel. The Posner's home was directly across the street from the Nazi party headquarters. The photograph was taken on the 8th night of Hanukkah by Rabbi Posner's wife, Rachel, on a cold December night. It was on a Friday afternoon right before Shabbat that this photo was taken. 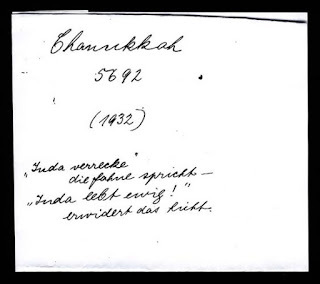 My grandmother realized that this was a historic photo, and she wrote on the back of the photo that ‘their flag wishes to see the death of Judah, but Judah will always survive, and our light will outlast their flag.’ My grandfather, the rabbi of the Kiel community, was making many speeches, both to Jews and Germans. To the Germans he warned that the road they were embarking on was not good for Jews or Germans, and to the Jews he warned that something terrible was brewing, and they would do well to leave Germany. My grandfather fled Germany in 1933, and moved to Israel. His community came to the train station to see him off, and before he departed he urged his people to flee Germany while there’s still time. This prophetic understanding of the wrath that was to come, saved most of Kiel's Jewish community. Eight Jews were killed while the vast majority escaped Germany before Hitler's systematic slaughter. Divine light always transcends human flags. Even as we sing, "And our flag was still there," flags of the nations, no matter how powerful, will one day come down. But the light will remain. The presence of the Lord will abide. Or, as the prophet Isaiah boldly proclaims, "The grass withers, the flower fades; but the word of our God will stand for ever" (Isaiah 40:8). For me, this photograph, and the Posners testimony, stands as a witness to this light. On Christmas Day, Christians will read the prologue to John's gospel. And in this poetic introduction teeming with the language of incarnation, we will hear that "A light shines in the darkness, and the darkness did not overcome it" (John 1:5). For Christians, this is the Light of Christ; of God entering the world in human form. But beyond the specificity of this light is a universal yearning for hope, equality, and justice that transcends the lines of belief. Which is why the menorah in the window offers us all hope in the face of despair. A reminder that light does indeed shine even on the darkest of nights. May you find light during this season of hope and expectation, recognizing that it often arrives in unexpected ways. Wherever and however you worship, may your life be illumined by the divine light that never dims or fades away. Wishing you, your family, and your community a meaningful holiday and blessings in 2018. Thank you for sharing this picture and story! This is a powerful article, and remarkable photograph. 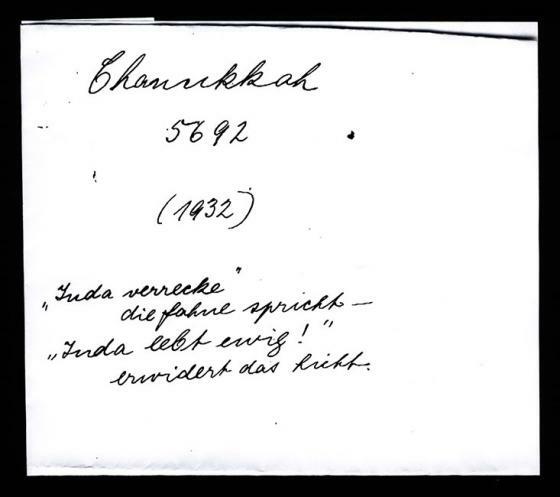 It may be interesting to note that the saying on the back of the photo is in the form of a poem. Thank you for following through in the sharing of this. Merry Christmass. Avánte, Upward and Onwards in 2018. Thank you - this is a deeply wonderful post.